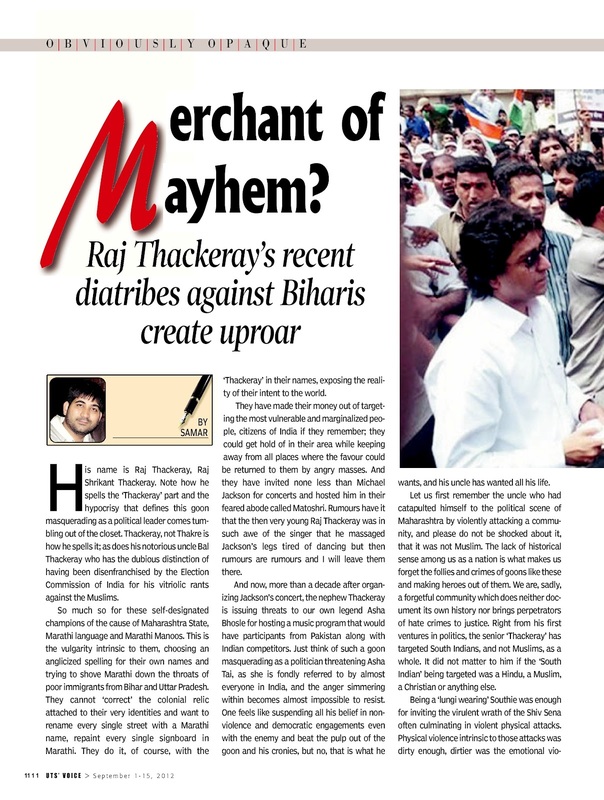 His name is Raj Thackeray, Raj Shrikant Thackeray. Note how he spells the ‘Thackeray’ part and the hypocrisy that defines this goon masquerading as a political leader comes tumbling out of the closet. 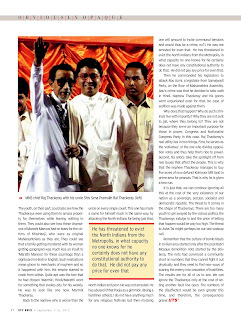 Thackeray, not Thakre is how he spells it; as does his notorious uncle Bal Thackeray who has the dubious distinction of having been disenfranchised by the Election Commission of India for his vitriolic rants against the Muslims. So much so for these self-designated champions of the cause of Maharashtra State, Marathi language and Marathi Manoos. This is the vulgarity intrinsic to them, choosing an anglicized spelling for their own names and trying to shove Marathi down the throats of poor immigrants from Bihar and Uttar Pradesh. They cannot ‘correct’ the colonial relic attached to their very identities and want to rename every single street with a Marathi name, repaint every single signboard in Marathi. They do it, of course, with the ‘Thackeray’ in their names, exposing the reality of their intent to the world. They have made their money out of targeting the most vulnerable and marginalized people, citizens of India if they remember; they could get hold of in their area while keeping away from all places where the favour could be returned to them by angry masses. And they have invited none less than Michael Jackson for concerts and hosted him in their feared abode called Matoshri. Rumours have it that the then very young Raj Thackeray was in such awe of the singer that he massaged Jackson’s legs tired of dancing but then rumours are rumours and I will leave them there. And now, more than a decade after organizing Jackson’s concert, the nephew Thackeray is issuing threats to our own legend Asha Bhosle for hosting a music program that would have participants from Pakistan along with Indian competitors. Just think of such a goon masquerading as a politician threatening Asha Tai, as she is fondly referred to by almost everyone in India, and the anger simmering within becomes almost impossible to resist. One feels like suspending all his belief in non-violence and democratic engagements even with the enemy and beat the pulp out of the goon and his cronies, but no, that is what he wants, and his uncle has wanted all his life. Let us first look at the uncle who had catapulted himself to the political scene of Maharashtra by violently attacking a community, and please do not be shocked about it, that it was not Muslim. The lack of historical sense among us as a nation is what makes us forget the follies and crimes of goons like these and making heroes out of them. We are, sadly, a forgetful community which does neither document its own history nor brings perpetrators of hate crimes to justice. Right from his first ventures in politics, the senior ‘Thackeray’ has targeted South Indians, and not Muslims, as a whole. It did not matter to him if the ‘South Indian’ being targeted was a Hindu, a Muslim, a Christian or anything else. Being a ‘lungi wearing’ Southie was enough for inviting the virulent wrath of the Shiv Sena often culminating in violent physical attacks. Physical violence intrinsic to those attacks was dirty enough, dirtier was the emotional violence emanating out of Sena’s chosen diatribes like ‘lungi hatao pungi bajao’ and ‘yendu gundu’. He was out to humiliate a people, again the citizens of the ‘largest democracy of the world’ if one wants to remember, who had the right to live anywhere in country guaranteed by the constitution drafted by someone from the very state, Babasaheb Bhimrao Ambedkar. The state that gave us Babsaheb, undoubtedly the greatest Indian ever born, also produced such scumbag Thackerays; irony of our times cannot get worse than this, can it? Well, back on the issue at hand, senior Thackeray did not stop at that. Having his hands soaked with the blood of hapless ‘southies’, he turned his attentions to others. Gujaratis came in the line of fire first followed by Marwaris. Amusingly, nephew Thackeray’s wrath against the North Indians is not his own but is stolen from the senior Thackeray who had targeted first the ‘Biharis’ and then people from North India as a whole. Interestingly again, this targeting did never include those in the higher echelons of society with even the editor of Hindi version of Saamana, Shiv Sena’s organ, being a North Indian! The attacks were reserved for the poor and hapless, like taxi drivers and hawkers. Another irony intrinsic to these attacks is that they are an outright insult to the legacy of Shivaji who fought on the side of the marginalised all his life and believed in Muslims like Ibrahim Gardi as his lieutenants. The rise of Shiv Sena has a history behind it. 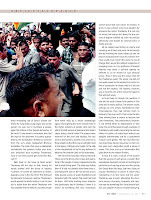 Those were the times when hopes and aspirations of the people of newly independent India had started falling apart. The state was failing them if it had not already failed them that is. Unemployment was on the rise almost across India leaving scores of youth disaffected and disgusted with the system that could not fend for them. With mills shutting down, situation was particularly bad in Bombay (I know it is known as something else now, Thackerays cannot shove that word down my throat). 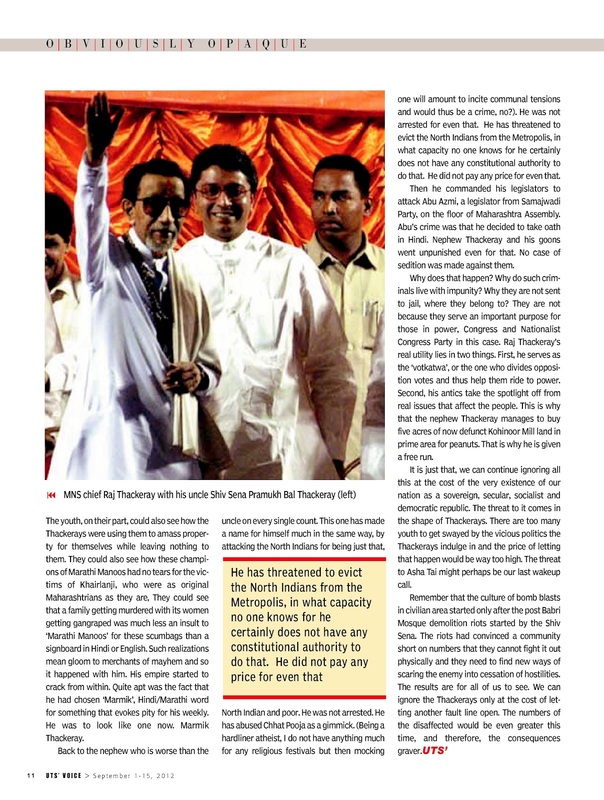 In short, it was a dream come true situation for someone like senior Thackeray. It is not only his name that betrays him being the true servant of bygone colonial raj, even his political philosophy was shaped by colonial policy of divide and rule. All he needed was finding an enemy and inventing one if there was none. He did exactly that by inventing the South Indians as one. He kept on doing that ever since. His ‘chosen’ enemies would never remain the same; he would change them as per the political exigencies of changing times. As it is, upliftment of Marathi Manoos was never a political agenda he believed in, all he strived for was personal power. That, in fact, was the reason that did the Thackerays apart. The senior one did not only want power but he wanted it to confirm to line of succession he chose, that is to his son and not the nephew. The nephew, however, was a maverick one and he would not agree to that and part ways. Let’s get back to, though, the question of why did the youth choose to be pawns of Shiv Sena and its murky politics. The answer would, perhaps, be very simple. Humiliated by their circumstances, they had nothing much to believe in their own worth. Then came the Shiv Sena offering them a chance to become law unto themselves. The phenomenon, however, is not limited either to Maharashtra or Shiv Sena; the world had seen enough examples of frustrated youth readily becoming the cannon fodder for politics of hatred even without any tangible achievements but for a guaranteed living in some ghetto. The very fact that they can drag those having resources by their collars gives such disgruntled youth a sense of power. This, then, acts as an intoxication that glues them to the master dividers. In fact, it is more a failure of the system than the success of such goons. A system that perpetuates inequality cannot do anything but producing such rag tag armies and thus giving Shiv Senas their field days. But then, riding on popular disaffection to power is easier than maintaining it as Shiv Sena and the senior Thackeray was to learn. Alleviating the structural sources of poverty, inequality and injustice was not something Shiv Sena brand of politics was capable of and so it started decaying. The youth, on their part, could also see how the Thackerays were using them to amass property for themselves while leaving nothing to them. They could also see how these champions of Marathi Manoos had no tears for the victims of Khairlanji, who were as original Maharashtrians as they are, They could see that a family getting murdered with its women getting gangraped was much less an insult to ‘Marathi Manoos’ for these scumbags than a signboard in Hindi or English. Such realizations mean gloom to merchants of mayhem and so it happened with him. His empire started to crack from within. Quite apt was the fact that he had chosen ‘Marmik’, Hindi/Marathi word for something that evokes pity for his weekly. He was to look like one now. Marmik Thackeray. Back to the nephew who is worse than the uncle on every single count. This one has made a name for himself much in the same way, by attacking the North Indians for being just that, North Indian and poor. He was not arrested. He has abused Chhat Pooja as a gimmick. (Being a hardliner atheist, I do not have anything much for any religious festivals but then mocking one will amount to incite communal tensions and would thus be a crime, no?). He was not arrested for even that. He has threatened to evict the North Indians from the Metropolis, in what capacity no one knows for he certainly does not have any constitutional authority to do that. He did not pay any price for even that. Then he commanded his legislators to attack Abu Azmi, a legislator from Samajwadi Party, on the floor of Maharashtra Assembly. Abu’s crime was that he decided to take oath in Hindi, the national language as per our constitution. Nephew Thackeray and his goons went unpunished even for that. No case of sedition was made against them perhaps because such cases are reserved for people like Binayak Sen who work for the dispossessed and marginalized unflinchingly and thus threaten the existence of the system that produces such merchants of mayhem. Why does that happen? Why do such criminals live with impunity? Why they are not sent to jail, where they belong to? They are not because they serve an important purpose for those in power, Congress and Nationalist Congress Party in this case. 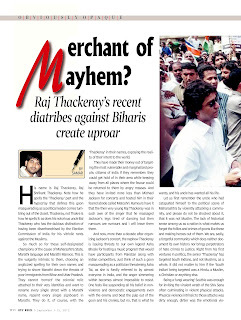 Raj Thackeray’s real utility lies in two things. First, he serves as the ‘votkatwa’, or the one who divides opposition votes and thus help them ride to power. Second, his antics take the spotlight off from real issues that affect the people. This is why that the nephew Thackeray manages to buy five acres of now defunct Kohinoor Mill land in prime area for peanuts. That is why he is given a free run. It is just that, we can continue ignoring all this at the cost of the very existence of our nation as a sovereign, secular, socialist and democratic republic. The threat to it comes in the shape of Thackerays. There are too many youth to get swayed by the vicious politics the Thackerays indulge in and the price of letting that happen would be way too high. The threat to Asha Tai might perhaps be our last wakeup call. It seems that, initially, big-b was protected by so called 'Muslim gangs' and Now he is in protection of Thakerays, clearly a change of hands.